I have been with Frogleys for 4 years and have always relied heavily on their product lines, knowing that they represent the pinnacle of quality in fishing gear. To have a formal association with their brands is incredibly humbling and fills me with the desire to perform at my best whenever I’m on the water. 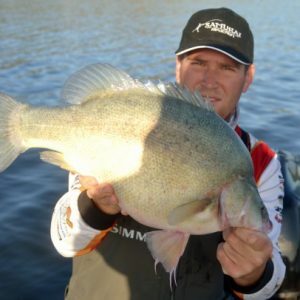 I’m always keen to try new techniques and use new technologies to try and improve my fishing, as well as exploring new territories and experience the natural world at its finest. I try to maintain a healthy involvement within the industry through writing, competing in tournaments and utilising social media. 2017 is my 8th year of competitive fishing, and I have no plans of slowing up, the atmosphere and pressure of a tournament is hard to beat and it keeps me coming back for more. I Compete in Australian Yellowbelly Championships, B.A.S.S and ABT tournament circuits. I write for Fishing Monthly Magazine and Freshwater Fishing Australia on a regular basis. If you’re keen to stay connected, check out ‘Chris Frith Fishing’ on Facebook, where I’ll be sharing tips and advice on how I use Frogley’s products to get onto some fish. I get around in a green Nitro 482 w/ 115 Mercury Optimax, it’s hard to miss so If you see me out on a dam come over and say G’day.